For most people, a gaming chair is equivalent to any other chair, but ask anyone who’s tried using the real gaming chair. They will tell you a myriad of benefits that they have over your couch or your office chair. Right form the way they feel, to how long you can sit in them without feeling any strain or pain. If you have ever spent several hours gaming while sitting on an office chair, then you understand the pain too well. With such an experience, you can attest to the fact that an office chair is not suitable for gaming. Let’s look at the major reasons why you should never think of using your office chair in your gaming station, especially if you game for long hours. Office chairs are designed for working, not for supreme comfort like the gaming chair. They do not come with proper cushioning and this is definitely not comfortable. For the first few hours, you may get a pass at the discomfort, but once you start approaching the sixth hour mark, the it will truly be unbearable. Office seats are not well padded and most of them do not have ergonomically designed headrests, backrests and armrests, which makes leaning over during gameplay an uncomfortable ordeal. If you are an avid gamer, or you play games professionally or competitively, then do not even consider getting an office chair for gaming. Office chairs are more about posture, while gaming chairs are intended for perfect comfort. 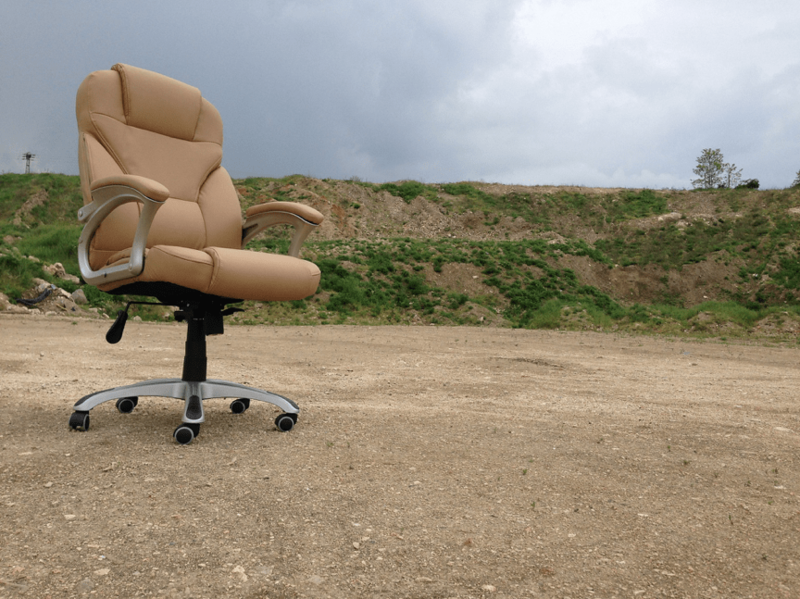 Office chairs do not offer supreme cushioning especially at the back area, which is very important in providing lumbar support and support to other parts of the body that experience strain during gaming. Gaming chairs also don’t have a frame or chassis that is ergonomically designed for gaming. Yes, it will provide the perfect upright posture, but when it comes to gaming, you won’t be able to maintain an upright posture for long. After a few hours of serious gaming, you will need to relax your body, and especially your back, by sitting in an almost lying position. This calls for a seat whose backrest can recline. This makes it easy for you to change sitting positions whenever you feel tired during gameplay, which is not possible when sitting in an office chair. An office chair can be described as an ordinary chair designed for office use. It does not come with any additional features, as they are not needed in the office environment. However, when it comes to most gaming chairs, there is incorporation of advanced technologies and features that ensure your gaming experience is topnotch. The first set of inbuilt features include gaming controllers. Some gaming seats are designed with inbuilt controllers such as steering wheels, brake and acceleration pedals, joysticks and control panels that you can use to play certain games. Then some gaming seats often come with inbuilt speakers. Depending on your game of expertise, you have a very wide choice of gaming seats with additional inbuilt features. Such gaming chairs will surely give you an all-round interactive gaming experience, a feat that no office chair could even achieve. As described above, office chairs are plain in terms of features. They lack enhanced ergonomics as compared to gaming chairs. The frame of the gaming chair is designed to enhance an upright posture so there is little adjustability. Most office chairs come with meshed backrests rather than the padded backrests present in gaming chairs. They also come with unpadded armrests that are not a norm for gaming chairs. When it comes to the general design of a gaming chair, it offers better ergonomics, each with an intended purpose that will encourage better performance as well as a responsive and interactive gaming experience. Gaming chairs are actually the king of ergonomics, with brands such as the DX Racer, Rocker Series, Giantex, Modway and Merax reigning the gaming world. Among these, the most preferred brand by gamers include this best DX Racer chair and other models of this brand. Having a smart gaming station is every gamer’s fantasy. To achieve seamless connection of all devices within your gaming station, a gaming chair is a definite necessity. Most gaming chairs can connect to gaming devices either via wired or wireless connections. For wireless connections, the most common technologies used are Wi-Fi and Bluetooth. This is completely different from what office chairs have to offer. The office chair offers no option that allows you to connect it to your gaming devices or peripherals. This limits the level of intractability between different elements of your gaming station. This completely disqualifies the office chair from being great at gaming. While most gaming chairs feature numerous storage options, the office chair comes with none. Some gaming seats feature compartments for storage and placement of gaming devices, which is not the case with office chairs. Gaming chairs may also feature a retractable control panel or stands for placement of gaming controllers, gaming tablets, headphones and other gaming devices that you would otherwise hold throughout the entire gaming session. This also is not a provision that comes with the office chair. In terms of ease of storage, most gaming chairs are designed with this in mind unlike office chairs that will be permanently placed in the office. Some of the gaming chairs feature foldable designs that are easy to store when not in use, thus great for temporary or small gaming stations. Most office chairs are not adjustable in any way. They do not have retractable armrests, fully reclining backrests and sometimes, they even do not have the adjustable height option. The only adjustability options present in office chairs is the ability to lock and unlock swiveling, adjust its recline a little and also its height just a little, all of which are available in gaming chairs and they are even more advanced. With their very small range of adjustability options, it is obvious that the office chair should not be preferred over gaming chairs. The battle between a gaming chair and an office chair is one that will be here for a long time, especially among PC gamers. For console gaming, there is no way an office chair will work, but for PC gaming, there is a high possibility for it to work significantly. However, a PC gaming chair will definitely trump the office chair in terms of better comfort, features and functionality. For other kinds of gaming, it is of utter importance for a gamer to recognize his needs and work around them to get the right type of gaming chair for their gaming station.